What could be more alarming than waking up in the middle of the night with a flooded bathroom? Plumbing emergencies need to be dealt with immediately. Often, in plumbing situations, a quick response can prevent a lot of hassle down the line. If you find yourself in a messy situation outside of regular business hours, we’re here to help! Whatever plumbing emergency your home or commercial building may need, associates at Hy-Pro Plumbing and Drain Cleaning are fully trained to tackle all emergencies with ease. Hy-Pro plumbers are trained to work quickly and effectively during your emergencies, ensuring your job is finished promptly and professionally. If you are experiencing a plumbing emergency, contact us to learn how we can help. Sometimes your plumbing issues can boil down to a clogged drain. In both residential and commercial properties, clogged drains can make a small problem seem much worse than it actually is. Hy-Pro specializes in clearing clogged drains, and we have specialized plumbing equipment to clear your clogged drain quickly, effectively and inexpensively. We can also help you understand the cause of your clogged drain to help prevent further issues from occurring. Wastewater can be destructive to commercial properties. So, you can imagine a plumbing and drain issue to and in your commercial space can mean a drastic loss of productivity and damage to your company image. As you know, time is money, especially for business owners. Whether your business is an office, restaurant or retail space, plumbing issues can drive away customers or bring productivity to a screeching halt. Your local Hy-Pro team is ready to go the minute you call us! Hy-Pro plumbers have the expertise to act immediately to identify the source of the problem, diagnose the issue, and eliminate any problems quickly with the utmost respect to your employees and customers. Furthermore, we will explain the best choice of action so you can fully understand the problem and the solution and identify any potential issues that may be coming down the road to your plumbing system and help you prevent any further problems for occurring. Once onsite, we will provide maintenance services to help prevent any future issues and keep your commercial property free of plumbing issues. It’s part of our dedication to providing top quality, expert emergency plumbing services to home and business owners across Southern Ontario. Contact us right away and forget about your commercial plumbing problems! When it comes to residential plumbing emergencies, your health and sanity can’t be compromised. It can be extremely frustrating to watch water fill your basement or a bathroom, spreading potentially dangerous wastewater throughout your home. Because we have local Hy-Pro Plumbing offices in your community, our emergency plumbers have the experience of working with homes in your area and can get there almost immediately. With years of expertise, chances are high that we have worked on a house just like yours in the past. Our experience in your community allows our plumbers to get the job done as fast as possible, and we’ll always treat you like family with courteous, friendly service. In the event that you require a 24 Hour Plumber for your home, Hy-Pro Plumbing, and Draining Cleaning is here to set your mind at ease. While you go back to work, back to a quiet evening in, or even back to sleep, our 24 Hour Plumber will work to restore your home to its former plumbing glory with one quick call to our service centre. Our teams of experienced plumbers at Hy-Pro Plumbing & Drain Cleaning are always ready to help, 24-7. We will make your plumbing emergencies a thing of the past. We resolve residential or commercial plumbing emergencies in an effective, timely matter, no matter what the problem may be. Our team is ready the minute you call us regarding whatever plumbing emergency you need. The sooner you act, the sooner we can eliminate your plumbing emergency. We’re available 24 hours a day, 7 days a week, and there isn’t a problem we can’t handle. Your local emergency plumbers will offer a full explanation of the repair process. We want to ensure that you fully understand the problem and the solution before beginning work. Got a question? You will receive an immediate consultation regarding your drains, external sewer piping, sinks, showers, toilets, or grease traps. 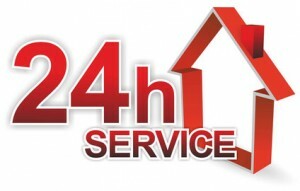 Hy-Pro Plumbing and Drain Cleaning is here to give you the 24 Hour Emergency Service you need.